The TORK C560M spring wound timer allows users to set fans, HVAC, whirlpools, motors, pumps and other appliances to automatically turn off, helping to save energy and money. The easy-to-use, twist dial timer features easy wiring with no neutral required, ideal for retrofitting existing wall switches. 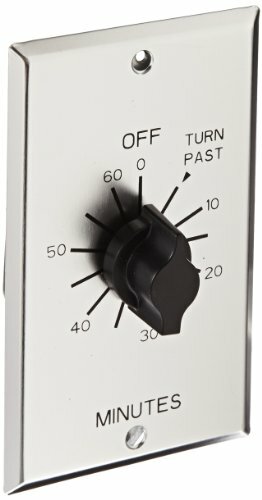 This timer is designed to replace any standard single or multi-gang wall switch. The "2-in-1" switch configuration wiring can be used for SPDT and SPST. The operating temperature is 32 °F to 122 °F (o °C to 50 °C). The timer includes a metal aluminum wall plate with screw mounting, adding extra security for commercial applications. This timer is not to be used in precision timing applications such as with sun lamps and saunas where inaccurate timing could have dangerous consequences. TORK has been a pioneer in the mechanical time switch industry since 1922.